I don’t know about y’all, but it does not have to be a Tuesday for me to want tacos. Heck, I could eat tacos everyday of the week and be satisfied. They’re SO extremely versatile and all of the combinations are delicious. 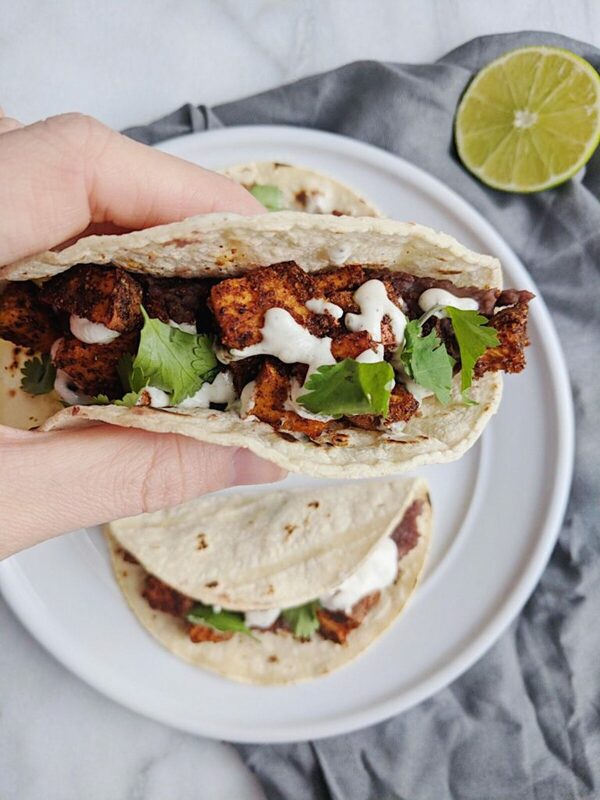 I especially love these Refried Sweet Potato Tacos with Lime Crema! They have a special place in my heart. I remember always having the most basic “American-ized” tacos when I was growing up. We would always get those taco kits at the grocery store, along with some ground beef. You put the taco seasoning in the beef, cook it up, add some tomatoes. You load up a flour tortilla that you warm in the microwave for 12 seconds with cheese first (so it melts), then beef, then sour cream, then lettuce, then salsa. And they were always the best thing ever. It wasn’t until I get older, and tacos really began to take off that I realized there were other choices! You mean, I can have chicken in a taco? Or fish? And coleslaw? Or cilantro? Wait, what even is cilantro? Those were most likely my thoughts as a 14 year old growing up in the South. 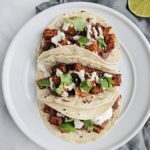 So, with these specific tacos, I really wanted to create a veg friendly version where they had all the flavor of that classic taco you love with a little bit of a tangy kick to them. And what better vehicle to use than sweet potatoes? Those delectable little orange potatoes are my world. For this recipe, I cut them into cubes. I skipped the taco seasoning and made my own spice mix including cumin, garlic powder, chili powder, salt and pepper. Popped them in the oven and they came out SUPER crispy and coated in this delicious spice rub that packed some heat and incredible flavor. 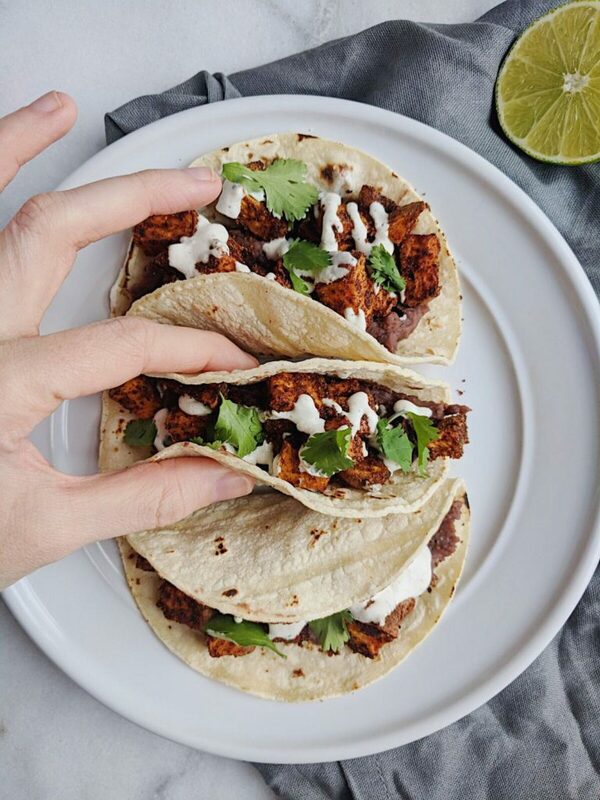 And because I just can’t eat tacos without some type of creamy element, I made a lime crema – which is just a fancy word for sour cream with yummy spices and lime juice. It is slightly tangy, creamy, and so delicious. The cool element of the crema really helps to balance the heat in the sweet potatoes. Oh, and just to be clear, the refried part of the taco is a big ol’ schmear of refried beans on the bottom of the tortilla! I personally LOVE refried beans. The texture is delicious and they add so much flavor. The brand I used is from Trader Joe’s – they sell cans of Refried Black Beans with Jalapenos and they’re the bomb. You’re more than welcome to make your own but I was in the mood for a quick and easy dinner so a can it was! So line of assembly: heat up a corn tortilla. I put these directly on the hot stove eye for like, 10 seconds – it gives them a nice char. Add a big scoop of warm refried beans, followed by the sweet potatoes. Top it with a drizzle (or a whole spoonful) of the lime crema. Sprinkle some cilantro. And you’re done. Time to devour. 2 medium sweet potatoes, cubed. Preheat oven to 400. Cut sweet potato into small cubes. Drizzle with olive oil, 1 tsp garlic powder, chili powder, cumin, 1/2 tsp salt and pepper. Mix together with hands until they're fully coated. Bake for 30 minutes. When about 5 minutes are left in the cooking of the sweet potatoes, warm up the refried beans. Set aside. 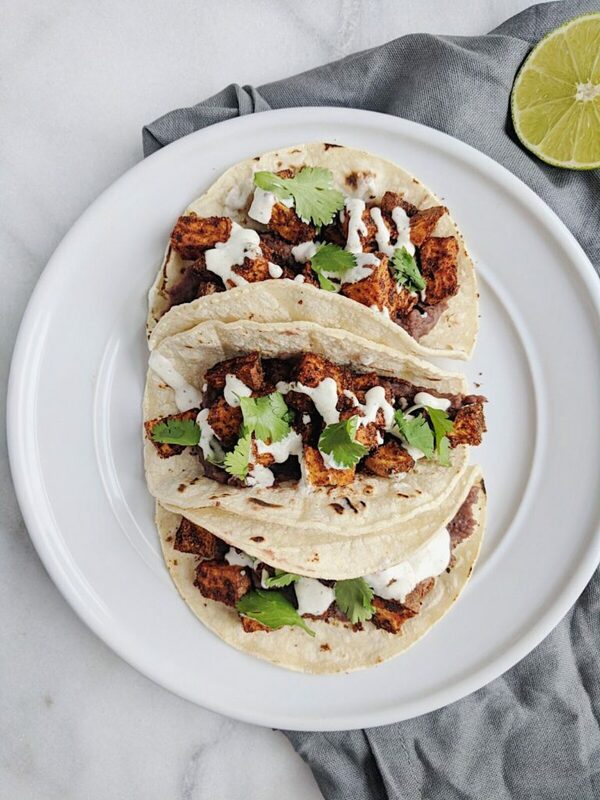 Mix the sour cream, half the juice of 1 lime, 1/2 tsp garlic powder, cayenne pepper, and salt and pepper to taste. Add more or less of each seasoning to your taste! When sweet potatoes are done, warm the corn tortillas. Time to assemble! 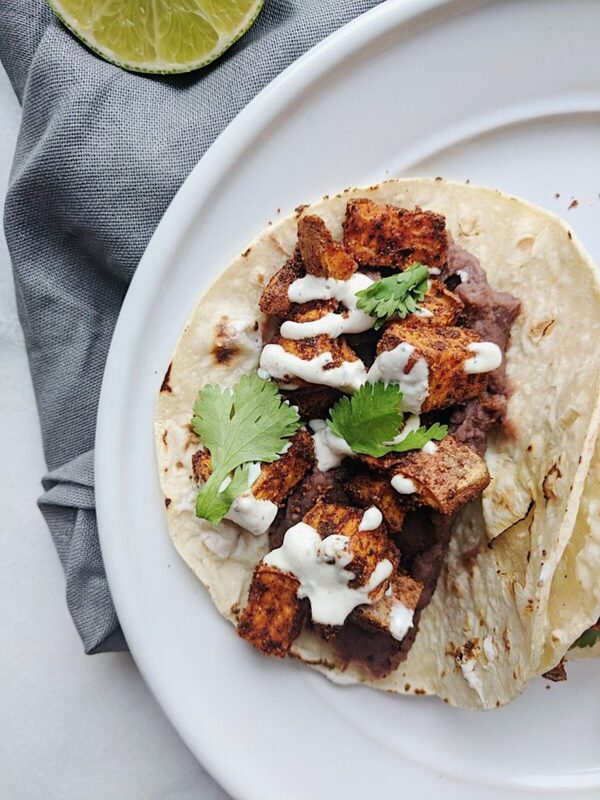 Add a spoonful of refried beans to the bottom of the tortilla, followed by some sweet potatoes, top with the lime crema and cilantro. Enjoy!